• Explore the popular area nicknamed "French California"
Basecamp Retreat is set up much like a hostel environment until renovations are complete. 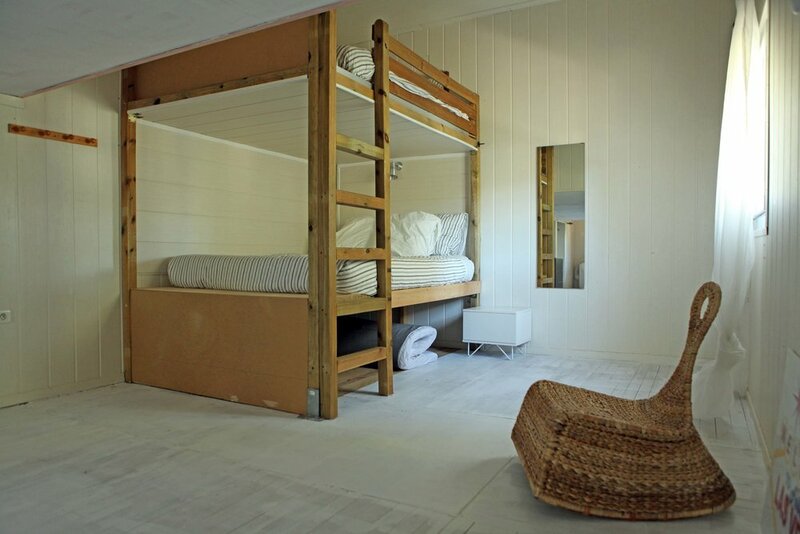 The converted building can sleep up to 22 people but we keep the photography retreats to a maximum of 8, offering 2 private rooms with a queen size bed in each, and a dormitory style room with 4 Queen beds (2 Queens are solidly custom built into a bunk), all with modest decor. While we are renovating only in the off season, we do have a shared bathroom (shower, bathtub, and sink) with 2 separated WC, and one outdoor shower. We provide a schedule on arrival day for everyone to claim their shower time. We will look forward to the time when we can offer upgraded amenities for our guests, please bare with us on this . As we work towards our goal to offer sports/photography retreat programs for wounded and recovering soldiers, specifically Battle PTSD sufferers, we hope you will utilise Basecamp and the Retreat Programs to help us offset the cost of our renovations. Eventually we will have 5 Queen size rooms, each with a fully accessible private bathroom, and 2 more full outdoor shower rooms with WCs. If you are interested in assisting our veterans on a journey to recovery, you can remember someone or gift yourself by buying a tile, large plaque, sporting equipment, or a full room/bathroom renovation to help out. Each one will have your name and a date or any name you choose etched on it and placed in the designated areas. Let us know how you'd like to be remembered. We ask that you bring whatever camera gear you are comfortable hauling around for a full day, and a laptop for editing. We provide free wifi 24 hrs a day. Two camera bodies are suggested, as well as a wide angle lens, 2.8 is best but 4. is good too, 24-105mm lens (kit lens is okay if thats your whole inventory), longer lens of 200mm (70 - 200mm zoom) or higher if you can carry it. Also consider a monopod or a lightweight tripod for the landscape. Just to note, flying with monopods and tripods can be tricky, please pack that in your checked luggage, (you won't be disappointed) Polarisers and filters are always a good idea. This is only a suggested equipment list, if you want to shoot with your phone camera, that is okay too, however you will need to provide a way to show your images at our nightly wrap up viewings. We would also suggest a notebook and pen for keeping track of your images or jotting out image ideas. Important note; French cell networks are relatively in-expensive but your home providers roaming charges may not be. Check with your provider for a travel plan, but most phones work well on wifi on the property. For clothing suggestions, a selection of light layers for the weather changes are best and some light rain gear. (April or October retreats are fairly cool in the early mornings and late evenings so think maritime gear.) Hiking boots/hiking sandals/sneakers are preferred for most of our days, but you might want to add in some lightweight flip flops for the beach and inside the property (or shower shoes) . The property is equipped with a large heated swimming pool, a small but well stocked weight room, as well as our proximity to the beach, so a bathing suit and/or work out gear is a good idea. We provide beach towels. We have a #skypepilates instructor if you'd like to book a remote pilates session(s)during your stay as well as spa treatments off property. Please bring whatever personal items you need to get through the week of adventures. Passport and appropriate travel documents required. North American and British guests need only present a passport at the border entry with details of your intended destination. All other countries please check with your local french embassy. We are pleased to provide accommodations, 3 healthy meals per day, (approximately 2 lunches self cater), transportation to and from scheduled photography adventures, boat/ferry tickets, vineyard entry fees. Bath Towels and Beach towels provided. Please note: Tips are not included and are at the discretion of the guest, please be kind to your housekeepers,drivers and tour guides. We also accept donations to the #SURFDOG project in lieu of gratuity. Once booked, we do our very best to give everyone the best experience possible. We reserve your seat and pay our staff whether you make it or not. We can provide a partial refund of 75% up until 90 days prior to the start date and 50% up until 60 days prior to the start date. After 60 days prior to the start date no refund will be provided, but we would suggest offering your spot to your friends or family. You may also take the opportunity to gift your spot to a veteran at this time.